Anand Rao is a Partner in PwC’s Advisory practice, is the Innovation Lead for US Data & Analytics and the Global Artificial Intelligence Lead. 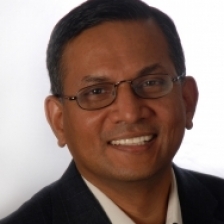 With over 30 years of industry and consulting experience, Anand leads a team of practitioners who work with C-level executives at some of the world’s largest organizations, advising them on a range of topics. His early career was focused in Artificial Intelligence (AI) – intelligent agents and their applications in aerospace, defense, telecommunications, financial services and insurance. In his current role, he advises enterprise clients across financial services, healthcare, automotive, and retail sectors in the deployment of AI solutions for strategic analysis, marketing, operations, supply chain, finance, and risk functions. With his PhD and research career in Artificial Intelligence and his subsequent experience in management consulting he brings business domain knowledge, statistical, and computational analytics to generate unique insights into the practice of ‘data science’. Prior to joining management consulting, Anand was the Chief Research Scientist at the Australian Artificial Intelligence Institute. He has held Board positions at start-ups and currently serves as a Board member for not-for-profit industry associations. He has co-edited four books and published over fifty papers in refereed journals and conferences. Anand was awarded the Most Influential Paper Award for the Decade in 2007 from the Autonomous Agents and Multi-Agent Systems (AAMAS) organization for his work on intelligent agents. He is a frequent speaker on AI, behavioral economics, autonomous vehicles and their impact, analytics, and technology topics in academic and trade forums.